Science isn’t always telescopes and new species. Some research, like the kind that helps forensics experts better understand crime scenes, requires experiments you might find just a little, well, morbid. When a bullet enters a body, blood can travel backward creating a pattern called “backspatter.” Telling the story of these backspatter patterns can be difficult, and studying them often require substitutes like animals, blood-soaked sponges, fake skulls, or even blood-filled coconuts. But one team of scientists wondered whether these objects were truly acceptable replacements for a living human body. So they used real human body parts instead. The study relied on two cadavers, both from humans who willed their bodies to the Southeast Texas Applied Forensic Science facility and specifically permitted their bodies to be used for research on trauma. The researchers successfully filled one of the heads up with 200 mL of cows blood, specially treated so as not to clot. The other head couldn’t be fully re-infused, probably due to some decomposition. The team then placed both the cadavers and a blood-soaked sponge in front of white, open, and upright boxes and shot a fixed pistol from behind the box to measure the backspatter patterns left by the head and sponge. The resulting patterns were quite different. The head left lots of differently-sized droplets, while the sponge left ones that were fairly uniform in size. The paywalled paper documents this all in some incredibly gruesome images. 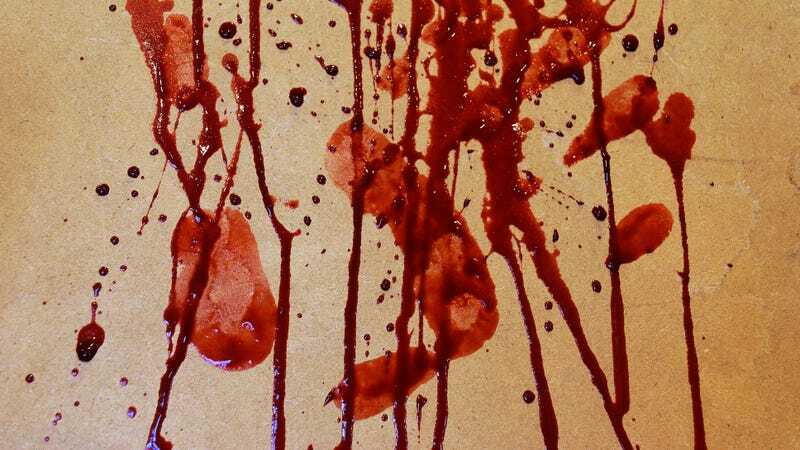 “An interesting, if somewhat disgusting paper,” said Stephen Michielsen, a professor at North Carolina State University who studies bloodstain patterns on textiles, but who was not involved with this research. “There is really nothing similar between the sponge and the cadaver from a mechanical point of view. However, it is valuable to document these differences,” he told Gizmodo via email. There are limitations. The cadaver was at ambient temperature, not body temperature, Michielsen pointed out. And there aren’t many conclusions that you can make from one head and only a single caliber of ammunition, the authors write. They did not respond to a request for comment, but Michielsen pointed out that it’s unlikely any number of repeat experiments could properly quantify the range of circumstances that would lead to blood backspatter. But ultimately, the authors write that it provides a new method to help train forensics experts hoping to study backspatter. That’s science for you, folks.